. Published on July 28, 2014. No matter how small a business might be, it’s important to project a professional appearance to new customers and prospects. For example, an email address from your business domain has more impact than, say, a standard Gmail email address. The same is true with your phone number. If you really want your business to look professional, it should have its own dedicated phone number — even if you’re a sole proprietor. Put another way, there are disadvantages to using your personal phone number, such as your own cell phone, as your business number, too. Combining professional and personal calls on one phone number makes it very hard to switch off the business calls during the weekend or when vacationing. You end up being “on call” 24–7. When you can’t take a business call, it goes to voicemail. No one else on your team has the opportunity to grab the call and make that personal connection with the customer or prospect. When you use your personal phone to make business calls, the customer you’re calling sees your private number on his or her caller ID. But do you really want to give out your private number like that? And wouldn’t it be more professional for them to see your business name and phone number instead? Life is simpler when you only need one phone, instead of juggling multiple phones. Since all calls go to one number, everyone — friends, family, customers, and prospects — hear the same outgoing voicemail greeting. Your friends don’t want to hear about your business hours or location when they call to chat. And your customers might be put off by a casual greeting. MightyCall lets you have one phone for business and personal calls — without all these disadvantages. You get a phone number for your business that works on the same cell phone you use for private calls. You can control when you receive business calls and when you don’t. You look more professional. You don’t give away your private phone number. Calls can be routed to others on your team instead of sending the caller to voicemail. And that’s what’s most important: keeping the conversation going with your customers. why it’s important to separate business life and leisure time. The world of commerce is quite a crowded place: new companies emerge every day in any imaginable industry, while large national enterprises make competition even harder with their lower prices and bloated marketing budgets. Luckily, a small business owner typically operates in a limited area, where people tend to know each other. Of course, an urban dweller sometimes doesn’t even know the name of a next-door neighbor, but they go to work, talk to friends and visit relatives. All of them are your target audience. And a virtual phone number is a tool to keep them connected. However, it can also benefit in some other ― sometimes totally unexpected ― ways. Word-of-mouth is a powerful asset which can and should be used to leverage your business because you can hardly afford a wide-span marketing campaign. Therefore, winning the love of local clientele is a prerequisite to success. How to do it? The main requirements are: projecting a favorable impression, delivering your services flawlessly and being accessible to potential clients. And a business phone system can help. Now and then startup entrepreneurs choose personal mobile numbers as their main instruments of business interaction. While it seems natural and simplistic (you don’t actually need to do anything), this habit can seriously affect revenues through impaired connectivity. When using only a personal cellphone for business, there’s a good chance to fail to respond: you may be doing something urgent at the time the call arrives, the line may be busy, the phone might get inoperable or tucked somewhere far, etc. Every missed call adds up to potential risk of losing customers: you will surely call back (if you remember), but a person may be too busy to answer. Alternatively, by the time you reach the caller, he may have already opted for another company or changed his mind. Tune an auto-attendant to provide essential information through the voice menu: business hours, pricing, available services, alternative contacts, address, etc. Thus, even if a call ends up unanswered, your potential customers are still able to find answers to frequently asked questions. What is even more important, they don’t feel neglected, they know that your business is up and running and are more likely to leave a voicemail or call back later. Asking your callers to leave a call-back request instead of plain voicemail is also a good option. They know that you are going to call and can even ask you to reach them at a particular time. Once the call is scheduled, a person feels obliged to answer. Many virtual phone systems offer intelligent call routing options. With this feature it’s possible to ring all your communication devices simultaneously (or according to customized rules) to minimize the chances to miss a call. Your mobile is dead? Pick a landline or even answer from your computer. This feature is extremely useful if you are a part of a team ― everyone can be reached via a single business number. In contrast to usual mobile or landline IDs, a virtual phone number always stays with you no matter where you are or what equipment you use. Even if you choose to migrate to another virtual system provider, it’s always an option to transfer an existing number. Just imagine: you can enjoy unlimited freedom and retain your communications presence at the same time. If a caller hears the beeps of a busy telephone line, a mobile number owner can only shrug and accept a missed call. However, a virtual number subscriber gets a benefit of additional incoming lines and a call queue. You can keep a caller on hold until you’re free to speak or delegate the call to a team member (either manually or automatically). And to save waiting clients from boredom, treat them with music or pre-recorded messages (special offers, promos, novelties, etc.) ― music on hold doubles the acceptable waiting time, while recorded messages triples them. Today everybody knows that an email address should look professional to inspire trust. It is also true for a CallerID — in the eyes of potential customers, a dedicated business number is a sign of a professional enterprise. This stereotype stems from the obsolete assumption that a call-processing system is an expensive asset, so only a thriving business with many clients can afford to purchase and maintain it. While it is still true for on-premises PBX systems fitted with costly equipment, now it is possible to enjoy all the PBX features on a software as service basis. You don’t have to buy or deploy anything ― subscribe to a hosted phone system and effortlessly gain such professional features as recorded greetings, automated attendant, multiple inbound lines, forwarding to any device and many more. What’s more, if a personal number is used for all purposes, everyone will hear the same outgoing voicemail message and here you have to choose between causality and professionalism. While your friends and family members are hardly interested in your business hours and other such trivia, customers may get diverted by something too casual/original/funny/misleading. But a call-processing system doesn’t merely make you look professional, it lets you act professionally. With a separate business line you’ll know that an incoming call concerns your business matters. Even before picking the phone you’ll assume a professional tone and prepare to discuss business-related issues. Even if you work from home, caller retention features will give you time to move to a quiet place where nobody will interfere with your conversation and no annoying noises will reach a customer’s ears. It’s even more useful if you have several partners/employees. A consistent communication model with a single business number and a system of extensions lets you drastically improve teamwork efficiency. Call redirection, conference conversations, presence statuses and detailed call statistics puts you in control of customer interaction within your company. Delegate tasks, criticize employees who tend to miss calls and reward hard-working ones, schedule briefings/meetings and ever record conversations if needed ― seamless teamwork saves time and boosts overall productivity. Combining professional and personal calls on one phone number makes it very hard to switch off the business calls during the weekend or when vacationing. You won’t risk missing something important and as a result, you are “on call” 24/7. Doesn’t add up to quality of life, right? In order to avoid stress it is strongly desirable to separate business and private life. A virtual phone system can help to accomplish this goal through advance routing rules. Among other features, it allows to set forwarding according to time and day of the week. For example, you can set an 9am Monday call to reach your cellphone directly, while a midnight call will be directed to voicemail. Exclusions can be made for key business partners: include them into a VIP list, which overrides all forwarding limitations and always reaches your phone. Naturally, blacklists are also supported. What’s more, voice mail is good protection against automated spam calls: luckily, robots haven’t learned to press “connect me to live operator” buttons yet. It’s now wise to publish your private contact data in publicly open sources such as advertisements, but that’s exactly what inexperienced entrepreneurs do. As a result, anyone can learn their number along with address, name and business field. Not only does it make small business owners an easy target for phone marketing, it can also compromise their financial security. Nothing will stop a fraudster from posing as bank employee, a relative in distress or whoever they can imagine. The next step is stealing your money though blackmailing or prying out sensitive credit card data. The one thing fraudsters have in common is expertise in psychology: they know exactly when to call and what to say in an exactly appropriate tone. As a result, you can even transfer the money quite willingly. Opting for a virtual phone number is a good security measure. Now there’s no need to print your personal data on business cards for everyone to see — distribute your professional contacts through marketing campaigns and expect only company-related calls to reach your phone. Robocalls will be barred by auto attendant and for there’s a black list for human telemarketers. Another point of concern is malicious software. If you rely on a personal phone for business affairs, you have to be extremely careful not to catch a virus, which can potentially steal/damage critical data, control a smartphone’s camera and microphone, send spam, etc. Of course, a virtual phone system can’t protect you from your own actions. However, you may rest assured that at least your business line will remain intact no matter what, while all the data stored at cloud phone system provider’s servers will survive unscathed. What’s more, provider have effective means to block virus threats aimed at your business number, such as a malicious code sent via MMS. Some hosted phone systems offer multichannel connectivity features, which can make a fully functional call-processing center out of your smartphone. For example, MightyCall offers mobile applications for iPhone and Android which can be integrated with social media profiles, email services and website widgets. Make and receive calls of impeccable quality, read and send SMS, check voicemail, read Facebook and Twitter posts directed at your company, sort out electronic letters ― from a single app. The application is also intended to improve the productivity of your customer interaction: you can easily assign communication tasks to co-workers (to answer emails, SMS and call-back requests mainly) and control their fulfillment. The application will automatically sort the activities by urgency (e.g. a call-back request from your website is more urgent than an email) and notify you if any of them remains unresolved. As a result, the number of ignored letters, calls and messages will drop to the minimal possible level. Detailed analytics on inbound/outbound calls is also available here. MightyCall complements its call-processing system with a couple of free WordPress plugins (Click-to-Call and Contact us) to maximize the communicational efficiency of your website: in an easy interactive way site visitors can view your business number, email address, location on the map and whatever else you want to share, and either reach you via VoIP or leave a text message. These messages can also be viewed through a mobile app. While the answer to the question “Does an SMB need a virtual phone number?” is “Yes, unconditionally!” there is still a problem of choice. All cloud call-processing solutions on the market are roughly the same with almost identical price-tags, so take your time to study the differences closely and find the best price-to-quality ratio. Or just save your time and subscribe to MightyCall’s virtual phone number powered by an advanced phone system. We’re sure that you won’t find a better blend of reliability, convenience and affordability combined with a plethora of professional features, so we’re offering a 30-day money-back guarantee. And the secret for success is: cater for your clients as good as you can, and let us take care of business communications. The competition among restaurants is fierce. These restaurant marketing ideas and strategies will help you improve your business and get attention from growling stomachs everywhere! Online store, local restaurant or repair shop? People will always have questions to ask. 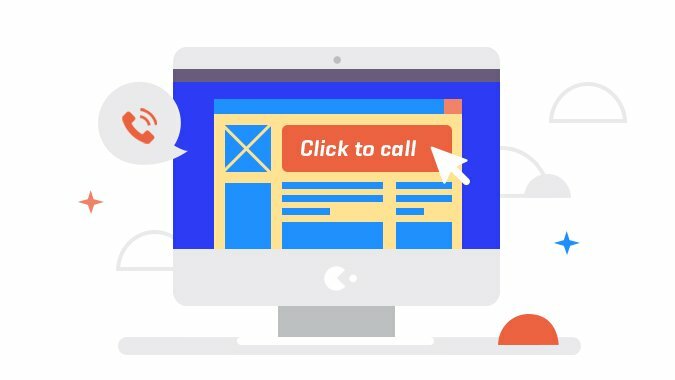 Let them do it right on your web site with a click-to-call feature. If you’re confident in the dental services you provide, then it’ll come down to the finer details—some things on the margins of your clinic, that guarantee you get and keep as many patients as possible. That’s where MightyCall comes in.